We have carved a niche amongst leading and eminent companies for offering an extensive range of cash boxes. This Cash box is highly acknowledged amongst the customers for their accurate dimensions and superior quality steel. One can use this Cash box in home, office, shops and many other places for security. netaji steel cash box available in table fit and without table fit arrangement. 10 " , 12" , 14" , 16" (in width). The overall size of the cash box is 155 H X 355 W X 255 D mm. Cash boxes are made from heavy gauge M.S. sheet metal & fitted with dual control key lock. Detachable false bottoms that can be fixed to counter, anchors the cash box to counter, when locked providing foolproof security. 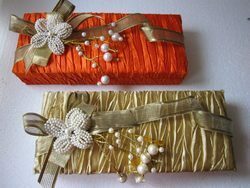 Our organization is among the most trusted organizations which deals in the offering Cash Box to the clients. 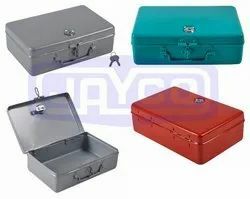 We manufacture metallic cash box in different sizes and shapes and colors for home and business purpose.